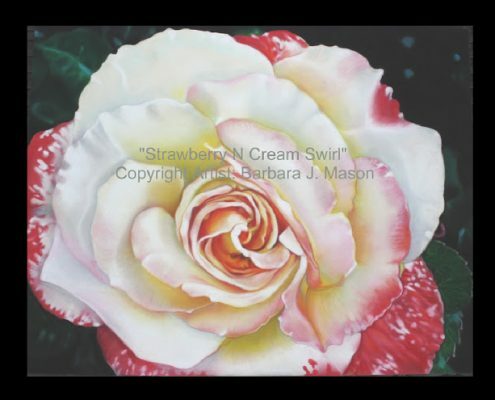 New Rose Pastel Painting! This is a painting of a soft cream and strawberry rose at Greenview nursery in Springfield, Illinois. Pastels allow me to capture the soft creamy petals of this rose. I painted this picture with my good friend Marla and her mother Jean in mind. Jean loved soft colors almost white! Well Jean I’m getting there. I working my way toward a piece of artwork in her memory! Titled: “Amazing Grace”. I’m learning to incorporate creams and white flowers that stay true to my style of bold painting! Not easy, but I’m up for the challenge!! Jean, I hope you are smiling from heaven when you see this one!! Past- els to Present It’s a Mellow Yellow Kind of Day!